My mom and sisters are hostesses extraordinaire*. They actually enjoy throwing together a party, planning myriad ways to delight their guests. I, on the other hand, do not enjoy party planning any more than I enjoy tooth extractions. I am much better suited to being the guest who is delighted. 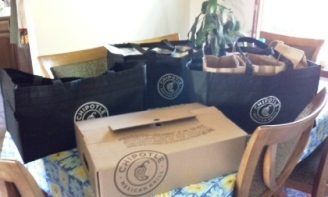 So I was thrilled to learn that Chipotle Mexican Grill offers catering. for groups from 20 to 200. My family is a fan of our neighborhood Chipotle restaurant, choosing it over other fast food places because it (a) has food that tastes good; (b) offers healthy and mostly clean (non GMO) options; (c) is straightforward about ingredients, telling us when it does use genetically-modified components; and (d) is affordable. 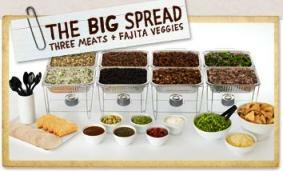 Chipotle's catering service was unveiled several months back, around Superbowl time. Along with other bloggers, I was invited to preview the catering service and given a coupon to use for my own Big Spread (3 meats) event (click for other options), which I finally did with a summer kick-off party for my Vino Support Group. Here are the steps I took to throw a party that delighted my guests. 1. Call 1.800.CHIPOTLE to place my order (at least 24 hours in advance of pickup). 2. Pick up my order at my local store one hour before the party. 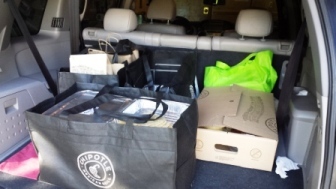 Four employees at my local Chipotle restaurant greeted me with smiles and helped me carry 3 bags and a box to my car, also going over brief instructions for the sterno setup with me. Apparently they got the gene that I'm missing. 3. Offload the bags to the party table. 4. Set up hot and cold items per instructions, and have guests dig in. I consider the summer officially kicked off. My guests were delighted and my genetic deficiency has been rectified for the time being. * come to think of it, everyone in my Vino Support Group is also a hostess extraordinaire. What are your tips for hosting a party the delights your guests? 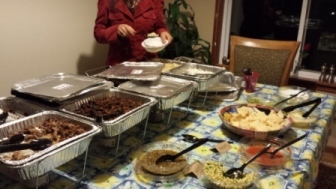 I was just looking at the Chipotle Catering last night because it's going to work out great for PTA Packet Pick up. I have many folks with dietary restrictions so there is something for everyone! My hosting technique is to provide copious amounts of food that (hopefully) tastes good. I spend most of my time cooking and let my husband do the socializing. But he's not very social either, so he tries to horn in on the cooking. This is why we don't entertain!